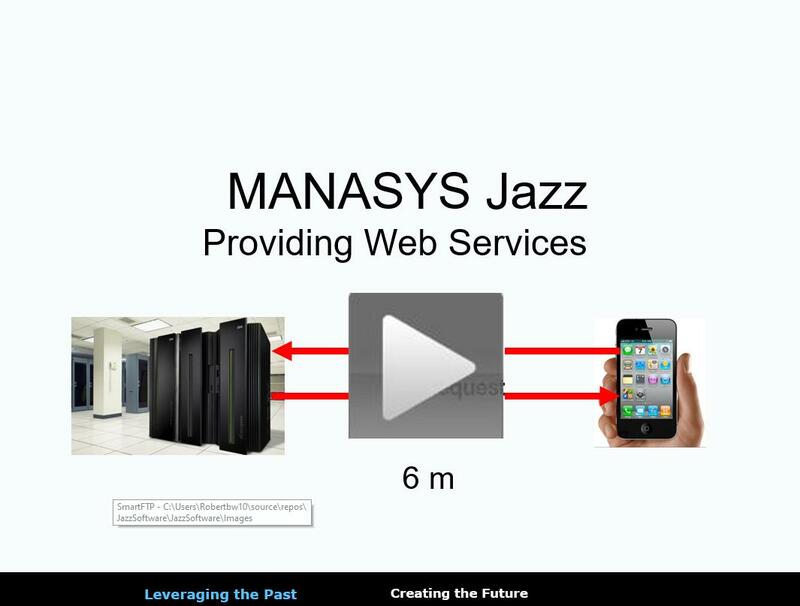 MANASYS Jazz slashes development time and cost, extending your scarce technical resources. 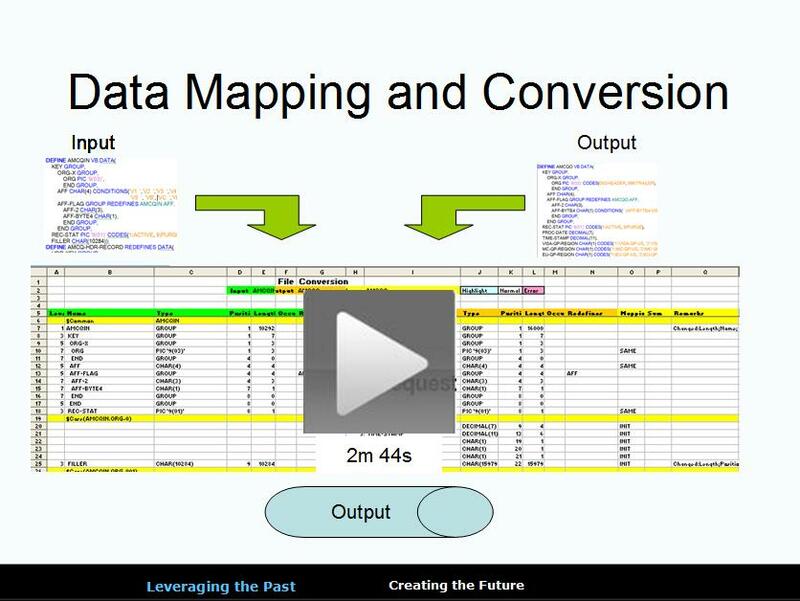 Get huge productivity gains! 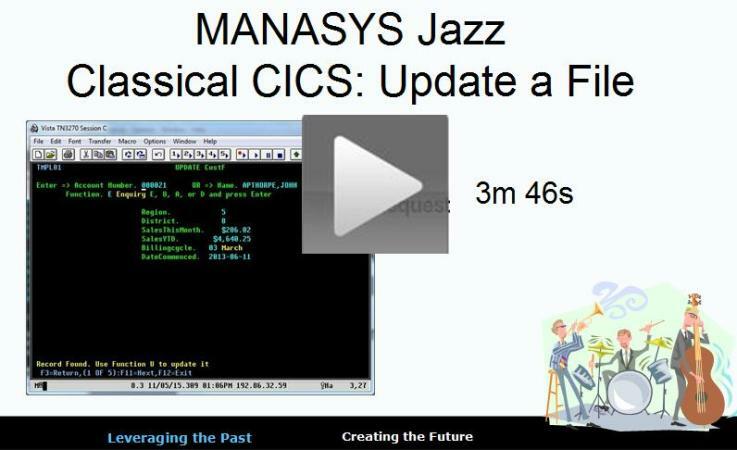 MANASYS Jazz handles zOS batch, Classical CICS, and Web Service Programming. Use it for all mainframe programming. 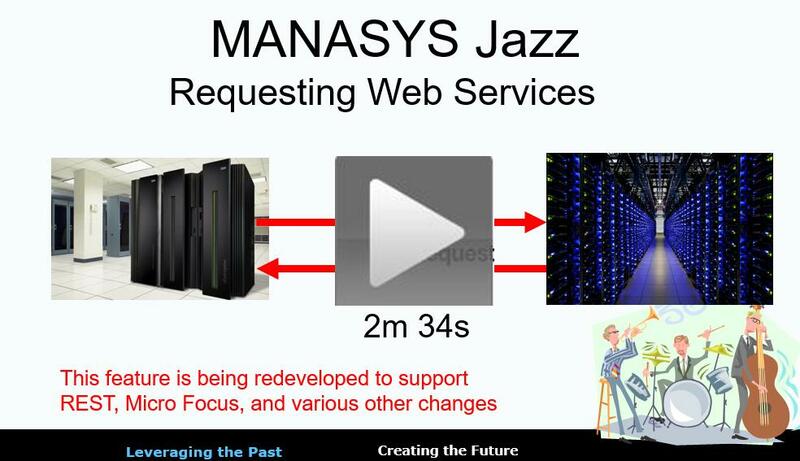 MANASYS Jazz unlocks your mainframe application data. 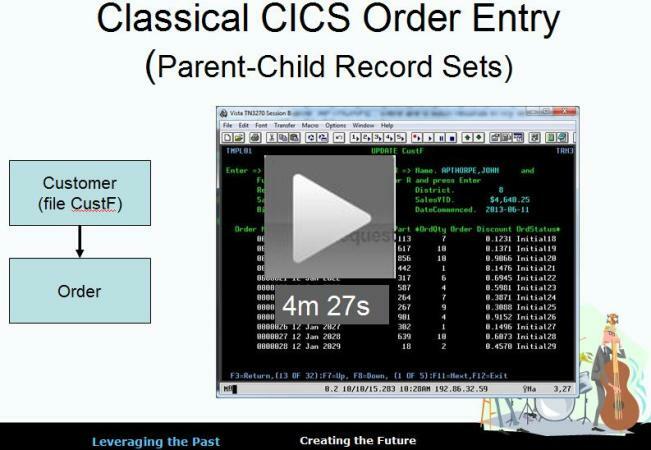 Incrementally add new functions to existing systems. 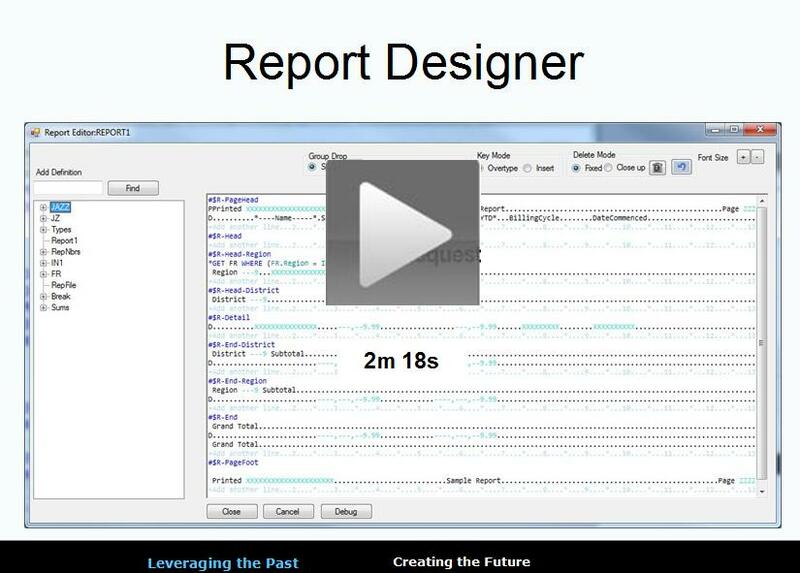 This first demonstration shows the simplicity and power of Jazz with a basic reporting example. Adding two lines of Jazz definition and one of Jazz logic to a generated template creates all the COBOL, WSDL, and Binding objects required to provide a web service. 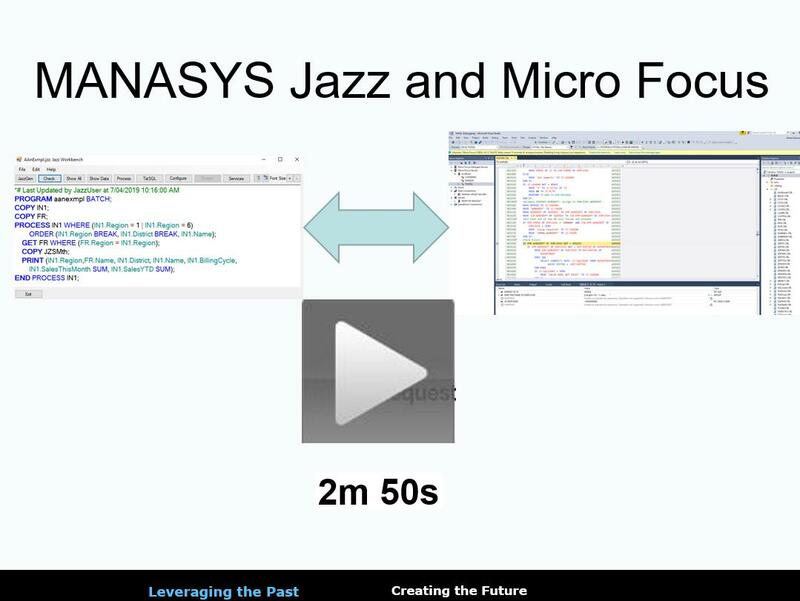 MANASYS and Micro Focus are natural partners, enhancing COBOL in different but complimentary ways. INVOKE (?) REPLY(?) initiates a services discovery dialog. With this resolved, one line of Jazz logic is enough to handle all COBOL, WSDL, and Binding requirements. From the record definition (14 lines) Jazz generates a screen and pseudo-conversational program to read a record by primary or alternate key, and update it. (43 lines of BMS, 1421 lines of COBOL). We extend the basic update program with another 19 lines of Jazz to provide an order entry program with both horizonal and vertical paging.